Fun 1 oz bubble bottle with bubble blower wand included. Features a round bright colorful bottle as shown. Logo can be printed on cap for excellent visibility. Sturdy plastic container. Sold in assorted colors. Size 1 ounce. Fun 2 oz bubble bottle with bubble blower wand included. Features a round bright colorful bottle as shown. Logo can be printed on cap for excellent visibility. Sturdy plastic container. Sold in assorted colors. Size 2 ounce. Fun 4 oz bubble bottle with bubble blower wand included. Features a round bright colorful bottle as shown. Logo can be printed on cap for excellent visibility. Sturdy plastic container. Sold in assorted colors. Size 4 ounce. 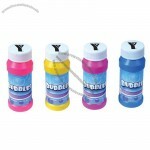 Custom-made Bubble Bottle From China Factory, Low price Bubble Bottle, Top Quality, True wholesale source for original!